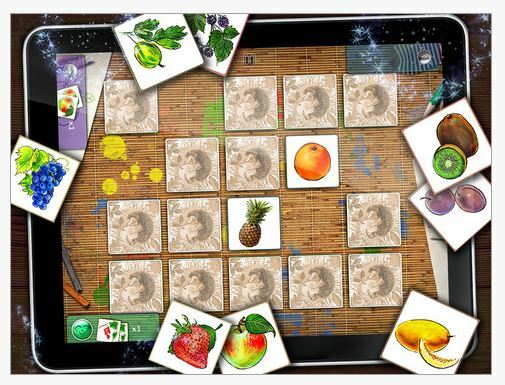 Awesome Memory app (free) for iPad is a simple memory matching game suited for all ages. This is an app I use with my mother whose memory is failing because it does not appear juvenile. She enjoys playing this memory game and it holds her attention with support for much longer than most other activities. I am also amazed at what she can hold in her memory to complete the game when fewer cards are provided, a great way to scaffold successful recall for her. It is just one of a number of iPad apps she enjoys during visits. While searching for resources on line I found this great article that featured Awesome Memory app and suggestions for using it for memory strategies with individuals with cognitive impairment. Megan Sutton, in her article ” Introducing Memory Strategies” describes her use of Awesome Memory app along with writing cues of what object was under each card for the user. Used as an example of how writing information down aids memory, Ms. Sutton explains in her article how she uses this as a precursor to writing information into a calendar or other note writing tool with clients. More tools and strategies for your OT mTool Kit. Sutton, M., October 15, 2012, Introducing Memory Strategies. Retrieved on 4-21, 2013 from http://community.advanceweb.com/blogs/sp_6/archive/2012/10/15/introducing-memory-strategies.aspx . This entry was posted in App Reviews, Apps for OT's, Apps for Special Needs, Cognitive Impairment, iPad, Memory, Occupational Therapy, Rehabilitation and tagged App Review, iPad, Memory, occupational therapy, OT Apps, Visual Perception. Bookmark the permalink.